On the Record Validation Job page, after clicking the Add New Job button the following job configuration pop-up will appear. 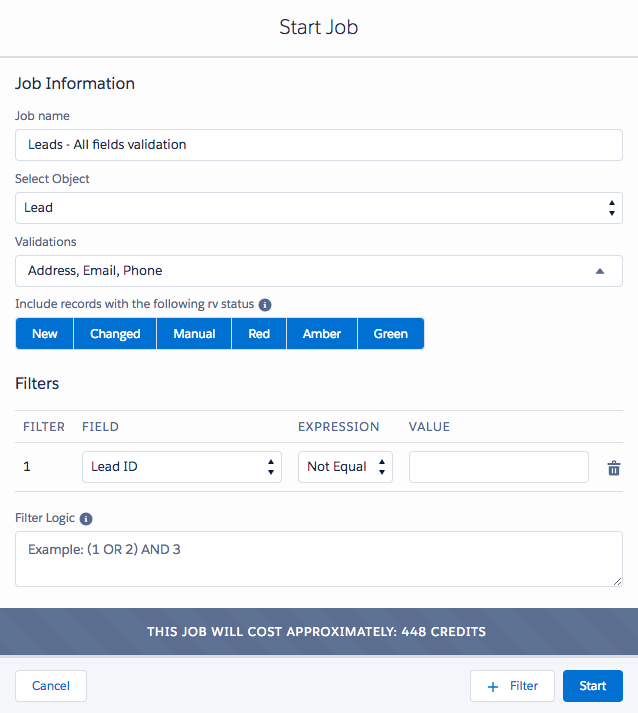 It gives you the opportunity to start a new Record Validation Job, choose which fields you want to validate, which records statuses to include and apply a filter. On the Record Validation Job page, there is a blue button on the top right side, the 'Add New Job' button. Clicking on the button lets you configure your new job. You can configure the following. Job Name Name your job. Select Object Select the object for validation. Validations Select fields for validation. Filter Add a filter to the job. Learn more about the Filter on this page. New All records that Record Validation did not validate before. Changed All records that were changed since the last validation. Manual All records that were manually validated by users. Red All records that Record Validation was not able to validate before because of unusable data. Amber All records that Record Validation has validated suggestions for. Green All successfully validated records.